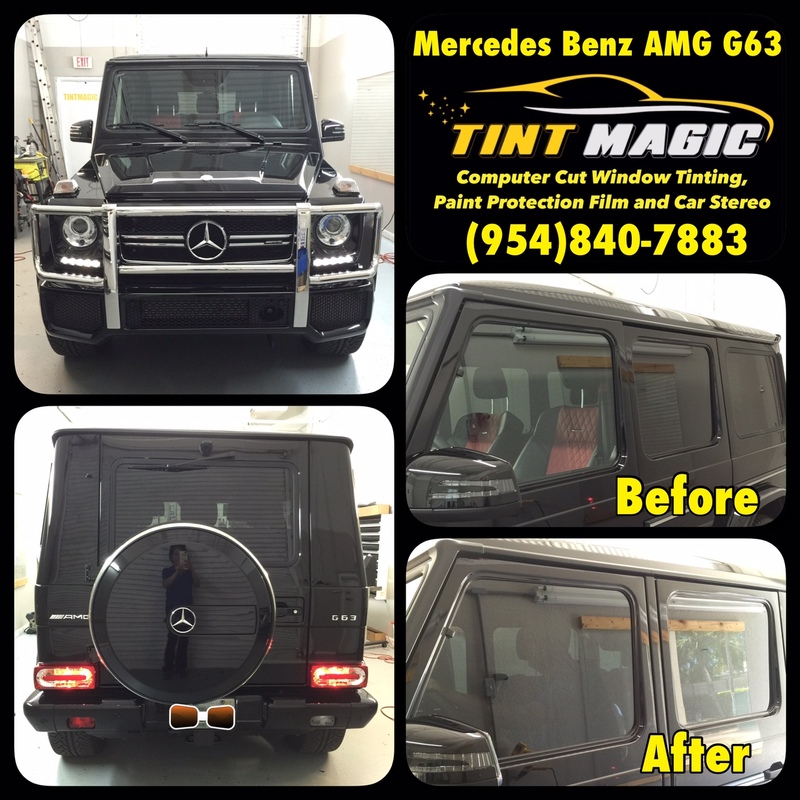 Mercedes Benz AMG G63 at Tint Magic Window Tinting Coral Springs, call us for the best quality and service! (9540840-7883. We are located at 11344 Wiles Road Coral springs,Fl 33076. Mercedes-Benz knows its customers perhaps better than any other manufacturer, a point best observed from the old-school helm of its burly Geländewagen SUV. When a cadre of highly affluent buyers—about 3600 in the U.S. last year—clamor for a mildly modernized 1970s-era military rig with which to pound the suburban pavement, the German luxury brand obliges. And so the 2016 G-Class receives yet another update to further extend its iconoclastic relevance into the 21st century, with the now mid-grade Mercedes-AMG G63 remaining our favorite of the bunch. Breathtakingly expensive, hugely powerful, and anachronistic in looks, this is not for the shy. With roots going back to 1979, the G63 retains its basic fashionista-meets-Sandinista look. Its twin-turbo 5.5-liter V-8 makes 563 hp and 561 lb-ft and mates to a seven-speed automatic. Mercedes’ all-wheel-drive system, 4MATIC, is standard. The G65 turns up the crazy even more with a twin-turbo 6.0-liter V-12 that makes 621 hp and 738 lb-ft. Note: These models replace the Mercedes-Benz versions. Mercedes allows the fun to continue up to a governed top speed of 130 mph, at which point the atmosphere is locked in a cage match with the G63’s blocky profile. Fitted with chunky Yokohama Advan S.T. tires on 20-inch wheels, our G63 also stopped from 70 mph in an impressive 163 feet. However, the big tires—and a hyperactive, undefeatable stability-control system—can’t help much with lateral grip around the skidpad, which amounted to only 0.63 g. Still, given the truck’s narrow track, slow and disconnected steering, and ultrahigh center of gravity, it’s a miracle the G63 doesn’t fall onto its door handles around corners. Fuel economy is as bad as you’d expect, with our test vehicle swilling a gallon of premium every 13 miles.